How to Recover Lost Data from Memory Card in Mac/Windows? I have an 8GB size of memory card and when I try to connect it with my computer, it shows error that I have to format it first. After the reluctant card formatting, all original data in the memory card are lost. What can I do to get back my data from that? I saved many videos and pictures in my memory card. Yesterday I deleted about 50 videos and 1000 pictures from the card because I was impulsive with some things. I tried to download some recovery programs to recover deleted files from memory card, but failed. Please help me what is the best and efficient recovery program that can help me recover all deleted files? Data on your memory card can be invisible and inaccessible because of various reasons such as card damage, human processing error, or breakdown in operating system. People think that they will lose the data forever but actually not! With the development of technology, we can make these invisible and inaccessible files readable and recoverable by using special skill, called Data Recovery, as long as they have not been overwritten by new data. Therefore, stop using the memory card at once and then read on the article to learn how to recover lost data from memory card. To perform data recovery for your memory card, you should choose a professional recovery program. 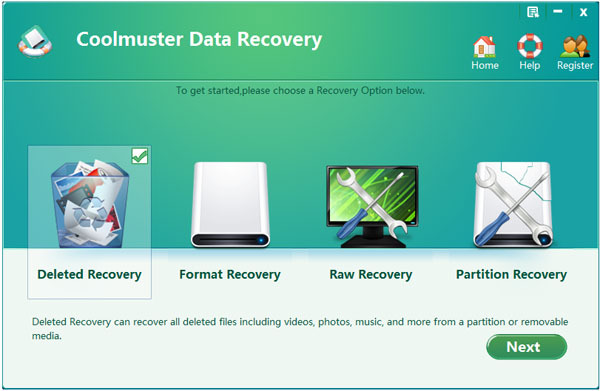 If you are using Windows OS, you can depend on Coolmuster Data Recovery, a award-winning recovery program that is fully capable of recover videos, audio files, photos and other documents from any kind of memory cards. If you are running Mac OS X, Data Recovery for Mac is specially designed for you. No matter you are using Mac computer or Windows 8/7, you can finish the card data recover process in only 3 steps. The following guide is based on Windows platform, while the operations on Mac are similar. Please remember not to use the memory card to save new data. Plug your memory card into the computer via a USB cable or a card reader. 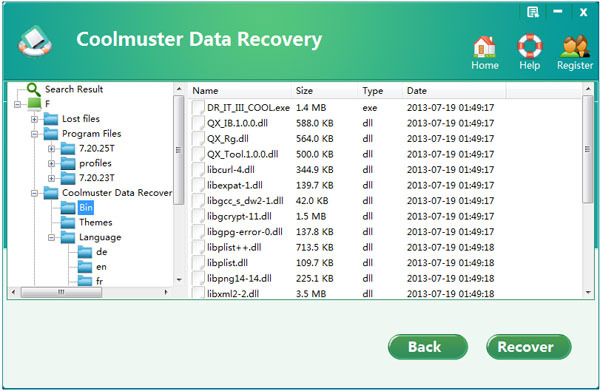 Install and launch the Coolmuster Data Recovery on your computer. Choose a recovery mode and click the button of "Next" on the bottom right corner of the interface to search for memory card. In the scanning result, all drivers and partitions will be scanned out and displayed. Just highlight the drive list for your memory card and click "Scan" to scan for your lost files. After a few seconds, all original files, including the deleted or formatted files will be shown in categories. Select the files you want to recover and click the "Start" button. Then, there will be a pop-up dialog box asking you to choose an output folder where you want to save the recovered files. Just select a save place then the card data recovery will begin. 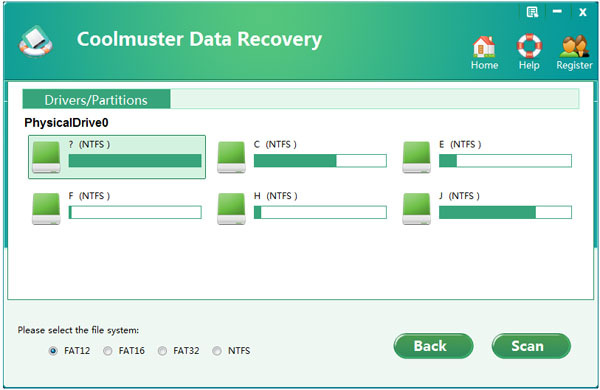 Coolmuster Data Recovery supports almost all memory card types, including SD card, MicroSD, SDHC, CF Card, xD Picture Card, Memory Stick and more. You know, memory card is quite important. Let Coolmuster Data Recovery be the Guardian for your card! Tips: How to Prevent Data Loss from Memory Card? 1: Never save your files on the same memory card. Just put your most important data in at least two storage devices. 2. Backup your files regularly, no matter what position they are saved. Thus, you can guarantee the safety of your crucial data. 3. Beware of the user error. No mater if you want or not, you have to admit that data loss in many cases is based on human error, such as accidental deletion or mistaken formatting. Just think twice before you perform an action on your precious data.